Your favourite debonair fox is back with a devilishly, aristocratic scratch card game. 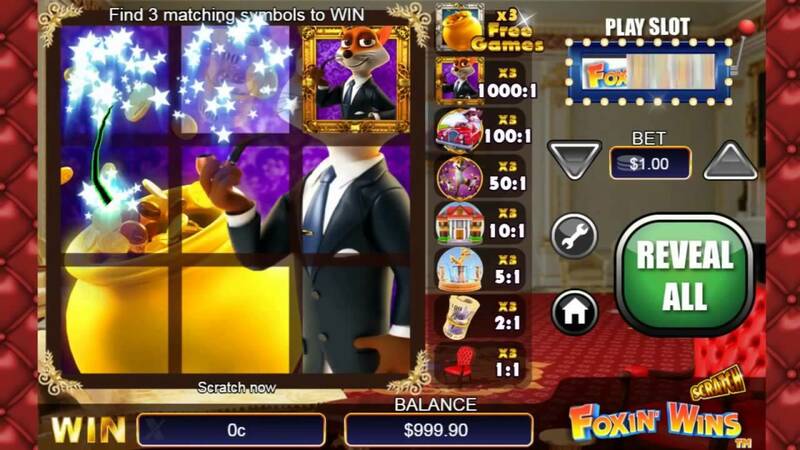 Enjoy the younger brother of the Foxin’ wins franchise and the lucrative 1000 fold jackpot will have you rubbing shoulders in the Fox mansion sooner than you think in this cunning online slot. NextGen Gaming was established back in 1999, they pride themselves on their innovative gameplay elements that they have created in their line of online slots games. The slots at NextGen Gaming casinos focus on giving players a more personal and interactive experience. NextGen’s video and scratch slots are loved and adorned for a reason; they are simply a joy to play. This online cash game serves as the digital version of the traditional scratch Cards, which we’ve all bought at some point or another down the corner shop. The Scratch Foxin Wins game is easy peasey to play as you simply need to scratch the online Card with your trusty computer mouse to reveal the prizes. There are lots of big prizes to be won and the same time the game promises to be highly entertaining. The entire purpose of this game is based on scratching the virtual scratch box, as you would a regular scratch card to unveil a whole range of amazing prizes. You just use the computer mouse to scratch. It is really as easy is that. Once the box has been revealed, you can find out the money or prizes that you have won. If it is one thing Scratch Foxin Wins has to offer, it is some pretty rich symbolism going on. The Mr. Fox symbol that is shown along with his sports car and mansion, all of which give off a sense of richness that shows that this fox certainly knows how to live it up. Just join him on his adventure and you can see if he has any rewards for you about to be revealed from those gleaming silver scratch cards. The minimum bet amount that can be staked for this game is £1 while the maximum amount can be as much as £200. The up and down button feature will allow a player to decide on whether to bet a higher or lower stake. The returns for this game is as high as 1000:1. This can mean that a bet stake of £1 could lead to a win online casino bonus of £1000. Wins can be in the form of real cash, big prizes, free scratch Card games and lots more. “The Reveal all” button is used to scratch all the given boxes at the same time, as to reveal all the hidden symbols. This serves as the quickest and most exciting way to let you know if anything has been won. Of course, for those who would like to skip this feature, simply use your computer mouse, to then scratch each of the boxes on a one by one basis. This game even gets easier if use is made of the “Auto play” button. The player can set the staked amount and then by pressing the “Auto” play button, the following range of games that can be played will then be displayed. This can be either 5, 10, 15, 20 or 25 games. The next thing to do will just be to choose on the preferred number of consecutive games then watch as all the fun begins. The “Auto play” function can also be paused and played, where you left off by simply pressing the “Play” button after which the player will be shown the number of games remaining. Real big money wagers can be made on this simplistic and easy but fun scratch card game. Scratch away the surface of the cards and reveal the debonair fox and win yourself some wonderful cash prizes. Foxin’ wins scratch is perhaps one of the best scratch games currently on the market.